TOLA TRIUMPHS, BEKELE BLOWS OUT! 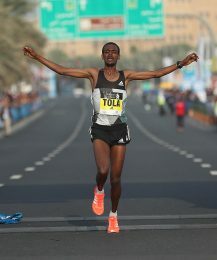 Tamirat Tola of Ethiopia broke the course record in the Standard Chartered Dubai Marathon on Friday morning, with two hours, four minutes and eleven seconds. But the much heralded world record attempt by his star colleague, Kenenisa Bekele was strangled at birth when the multiple champion and world record holder fell at the start, and got held up in the pack while the leaders accelerated away at world record breaking pace. Bekele never got back on terms and the injuries sustained in the fall caused him to drop out just after halfway. It seems that Dubai is not good for Bekele’s health or fortunes; this is the second time he’s dropped out of the marathon here. Two years ago, it was with a hamstring injury, this time he strained a calf when falling. Through his manager, Jos Hermens, he said, “I came to Dubai to do something special – however it was not to be. I fell down at the start and got hurt. I tried to run, but it did not work. I hope to come back to Dubai one day and show what I can do here”. It’s always gratifying to see a first class track runner translate his talent into marathon success, and Tola, who won 10,000 metres bronze in the Olympic Games in Rio de Janeiro last summer emphasised just how much progress he has made in the marathon by taking over two minutes off his debut time of 2.06.17, set when he finished fourth here in 2014. It is a measure of his ambition that he was dissatisfied with his finishing time today, as he was with his third place in Rio. The early fast pace in Dubai, with the pack of a half dozen as much as 45 seconds up on world record pace at halfway, told in the latter stages, and Tola finished over two minutes outside the world record of 2.02.57 by Dennis Kimetto of Kenya in Berlin 2014. And despite this marathon success, he wants to stay with 10,000 metres for the IAAF World Championships in London this summer and, he says, “Win the gold medal this time. “The pace was very fast at the start,” he said of today’s race. “The 15k time (43.26) was much too fast. But when we found that Kenenisa was well behind, I became more confident. I’m happy to win, but I think I could have run under 2.04”. 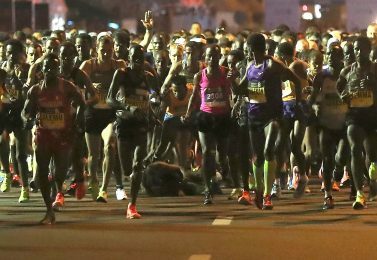 That would have secured him a $50,000 bonus in addition to the $200,000 first prize; because late on Wednesday, Race Director Peter Connerton added the bonus to up to five men finishing under 2.04 as an incentive to keep running right to the end, hoping they would ensure a fast pace for Bekele. But in the scrum at the start, he fell in the scramble, and couldn’t get us fast enough to give chase to the rapidly accelerating lead group, and when his calf muscle began to tighten, with him up to a minute adrift of the leaders, he had to stop to massage himself, and the cause was lost. He dropped out shortly afterwards, while Tola was waging a war of attrition with several other Ethiopian colleagues which he finally won shortly before 30k when the last of his challengers, Sisay Lemma dropped back. At that point Tola was still only one second shy of world record pace (1.27.39), but the final pacemaker then dropped out, and with close to a minute lead by 35k, Tola could afford to relent, and cruise to victory, breaking colleague Ayele Abshero’s course record of 2.04.23 from 2012. Another Ethiopian, Mule Wasihun had dropped back to third at one point, but he rallied to finish second, in 2.06.46, with Lemma hanging on for third, and an Ethiopian sweep, in 2.08.04. It was a similar finale in the women’s race, though that remained competitive until much later in the day. There was a still a group of seven women together until close to 35k, when marathon debutante, Worknesh Degefa started to force the issue. She is a superlative half-marathoner, and put the extra training distance to good use by running away from all but Shure Demise, one of the pre-race favourites. Demise managed to claw back some of the deficit in the penultimate kilometre, but when she saw that Degefa was still running strongly, she was forced to settle for second. Degefa won in 2.22.36, with Demise on 2.22.57, and compatriot Yebrgual Melese on 2.23.13. ← BEKELE GOES FOR TREBLE!